A free college course and internship open to all aim to bring in different cultures. LEWISTON — A walk through the halls of Lewiston Middle School would quickly show you that the student population has become much more diverse. 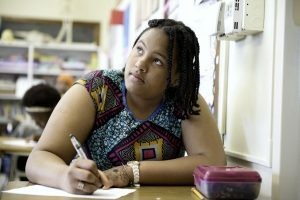 About 40 percent of Lewiston public school students are black or another minority, making the city’s schools among the most diverse in Maine. 60: Percentage of Lewiston students who are white. 56: Percentage of Portland students who are white. 496: Number of faculty in Lewiston schools, as of February. 11: Number who are not white. 271: Number of education technicians. 16: Number who are not white. 203: Number of substitute teachers. Tharcila Gonselvez works in her English language learners class at Lewiston Middle School. She said hiring more nonwhite teachers is a good idea and they would be good role models. By contrast, all but a few teachers in Lewiston are white. 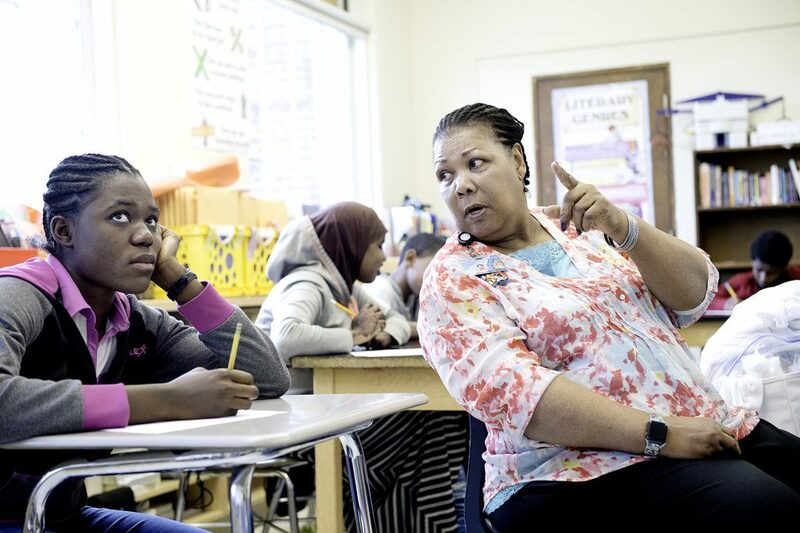 “Until last year, I was the only black teacher in this school,” said Barbara Benjamin-McManus, who teaches at the middle school. The district has wanted to hire more non-white teachers, Superintendent Bill Webster has said, but the applicants haven’t shown up. A new effort, the Educator Diversity Initiative, is aimed at changing that. The school department is teaming up with the University of Southern Maine’s Lewiston-Auburn College to offer a free, three-college-credit course and a summer internship to introduce people to teaching. The course begins July 6. It’s open to anyone, but Webster hopes it will attract non-white people considering a career in education. “Our students do best when, within the educator population, there are teachers they can relate to,” Webster said. 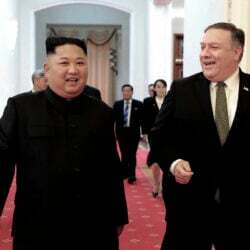 Having more teachers whom non-white students can connect with would enhance those students’ educations, he said. “One of our district goals is to have our staff be more reflective of the diversity of our student body,” Webster said. The new summer program is similar to one begun last year by the Portland School Department and USM to attract more non-white educators. Lewiston has dozens of non-white substitute teachers and education technicians who may be prime candidates, Webster said. 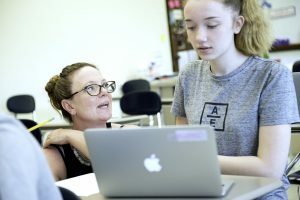 Some of the city’s substitute teachers have teaching credentials from other countries, but those credentials haven’t yet been translated to Maine teacher certificates. “We also have substitute teachers who haven’t thought about education as a career,” Webster said. Students and teachers recently interviewed at Lewiston Middle School said they like that the School Department is trying to hire more non-white teachers and ed techs. “I absolutely think it’s needed, provided we get qualified, efficient teachers who can reflect our diverse community,” Benjamin-McManus said. Social studies teacher Karla Good works with eighth-grader Tara Nash during class at Lewiston Middle School. Good said it is essential to attract more nonwhite teachers to a school district with such diversity. Because she is black, some non-white students are naturally more comfortable with her until they get the time to build relationships with other teachers. In a recent English language learners class, student Tharcila Gonselvez said having more non-white teachers was a good idea and would offer additional role models. Seeing black teachers could encourage black students to think maybe they should become teachers when they grow up, she said. McKenzie Anderson, a white student, said a diverse faculty would help everyone, black and white. Another student, Isho Abdullahi, and Bahar both said that with so many white teachers in the schools, some black students are quick to suspect a white teacher is a racist. “If a white teacher talks to more white kids than black kids, (students think), ‘Oh they’re racist,'” Bahar said. A more blended faculty would diffuse that suspicion and create a better school environment, students said. For those interested in taking the three-college-credit course at USM-LAC that introduces people to teaching, contact Lewiston School Department Director of Human Resources Carol Burnham at [email protected] The course begins July 6.